Islanders gathered at Arboretum greenhouse to wish Mrs. Hill happy birthday. Mary Louisa Butcher Hill always wanted a greenhouse. So for her 100th birthday this week, Mrs. Hill - who is known to everyone on the Vineyard as Polly - finally got one. The Polly Hill Arboretum on Tuesday unveiled its new 1,300-square-foot greenhouse as a gift to Mrs. Hill - the legendary horticulturist and longtime Island seasonal resident who founded the public arboretum on her family's historic sheep farm in North Tisbury. 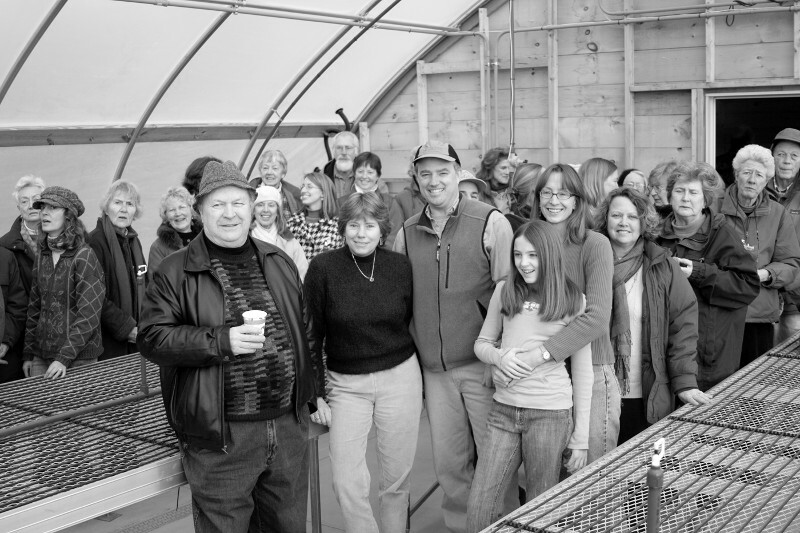 Almost 100 people attended a dedication ceremony on the brisk winter afternoon, crowding into the greenhouse and adjoining building to sing a group rendition of Happy Birthday to Polly. Unable to make her usual pilgrimage to the Vineyard for the past few years, Mrs. Hill on Tuesday celebrated her centennial with friends and family at her home in Delaware. But arboretum board member Margaret Sibert said her longtime friend and colleague would have greatly enjoyed the event this week. "Polly would have loved being there," Mrs. Sibert said the next day. "There were some of her wonderful old friends, people who were involved with Polly long before the arboretum. She must be thrilled about the greenhouse, which will allow us to grow a lot of her very special trees that really need propagating so other people can have them." Mrs. Hill impressed many fellow horticulturists with her ability to grow what she did on the Vineyard without the use of a greenhouse. Mrs. Hill tried growing species from seed that no one ever thought would succeed at this latitude, and in the process discovered more than 60 different horticultural varieties, most of which she named after friends and family members. It was this bold experimentation - as well as her spirit of sharing and generosity - that earned Mrs. Hill her international reputation in the horticultural field. She never sold her seeds, preferring instead to give them away, sending them through the mail to interested horticulturists across the globe. She received many prestigious national horticultural awards, and served for a time as the president of the American Horticultural Society. With the passing of her 100th birthday, what is perhaps most amazing is that Mrs. Hill did not begin her horticultural work until the age of 50, when, in 1957, she took over the family sheep farm, known as Barnard's Inn Farm, and started to work on the grounds. A Pennsylvania native who had previously earned a music degree at Vassar College, Mrs. Hill went back to school at the University of Delaware and enrolled in courses in botany and taxonomy. She planted her first small nursery bed in 1958, the humble start of an effort that eventually would lead to more than 20 acres and over 2,000 species in cultivation. "It's a very inspirational story, looking at Polly at the age of 50 when she took on this grand experiment," arboretum executive director Timothy Boland said this week. "It has inspired a lot of people who have decided later in life to try something new." Right from the start, a primary goal of Mrs. Hill was to expand the list of plants growing on the Vineyard, which she thought of at the time as "horticulturally impoverished." Her most famous discovery is the family of more than 20 North Tisbury azaleas - low-growing, late-blooming plants that flower in mid-summer - which she named after all of her children and grandchildren. Mr. Boland said Mrs. Hill now is working on a needlepoint of a Julian magnolia, the special variety that she named after her late husband, a chemical scientist from the Massachusetts Institute of Technology who is credited with helping to invent Nylon. "A key to her success was her willingness to experiment and try new things," Mr. Boland said. "Polly always had a real optimism for the future. When you decide to plant a tree, you have to be optimistic. You are looking to give something to a future generation." As part of its mission to protect plant species for the future, the arboretum in recent years has started to broaden its work by joining with other Vineyard conservation groups to identify and monitor rare plant populations in both protected and unprotected areas, and to raise awareness about harmful invasive species. In addition to plant production, the arboretum also plans to use the new high-tech, climate-controlled greenhouse specifically for education and research. It is all part of a larger effort to carry on the work of Mrs. Hill, while adapting to new challenges in an evolving world. "Her legacy is something that challenges us, and also calls on us to see what we can do to help our immediate community here on the Vineyard," Mr. Boland said. "One of the messages with Polly and our education program is that we're taking away from nature in so many ways, that for kids it's almost like they travel to a different world when they show up here. How we continue her legacy is promoting that aspect of this place." Roughly 10 years ago, through a joint effort by the Hill family, the Commonwealth of Massachusetts, the Vineyard Conservation Society, and the late West Tisbury summer resident and distinguished scientist David H. Smith, the arboretum property was preserved in perpetuity and formally opened to the public. The property now totals more than 70 acres. Though she is no longer seen driving around the North Tisbury fields in her trademark yellow golf cart, Mrs. Hill still keeps tabs on the plants by sending regular faxes to the arboretum staff. She might be in Delaware, but her presence is felt on the Island through the arboretum that bears her name, as well as the many varieties that she named after loved ones. Just like her long-standing dream of a greenhouse, another wish of hers, captured in an American Horticultural Magazine article she wrote in 1964, has since come true: "I hope that some of the foreign plants I have had so much pleasure in growing will take hold in the Island soil and become permanent Vineyarders."